The SureDesk™ needs a certain amount of internet speed to perform optimally. If you are finding your SureDesk™ is slow go to www.suretech.com/speedtest and click . 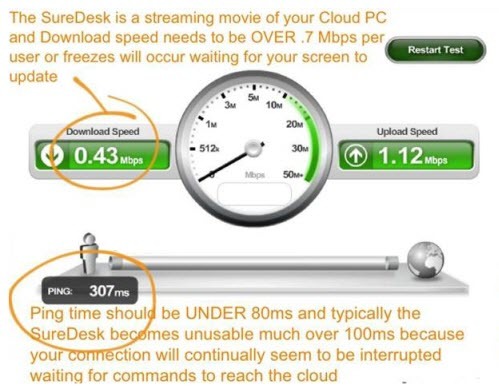 The SureDesk™ is a streaming movie of your cloud PC and the download speeds need to be over .7 Mbps per user or freezes will occur as the SureDesk™ waits for an update. The Ping time should be under 80ms and typically the SureDesk™ becomes unusable much over 100ms because your connection will continually seem to be interrupted as the SureDesk™ waits for commands to reach the cloud. You can go http://speakeasy.net/speedtest to check the connection from your local speed as well.